Rinse the rice until the water runs clear. Cover in water and soak overnight. Drain before using. Place the water, rice and leaf or vanilla pod into a pan and simmer over a medium heat for approx 45 minutes. Add more water as you need to. Don’t forget to stir the rice to prevent it sticking to the base of your saucepan. Add the sugar and continue to cook until almost all the liquid has evaporated. Remove the rice from the heat when ready and season with salt. Allow to cool. Serve drizzled with coconut cream, coconut threads and sliced fresh fruit. 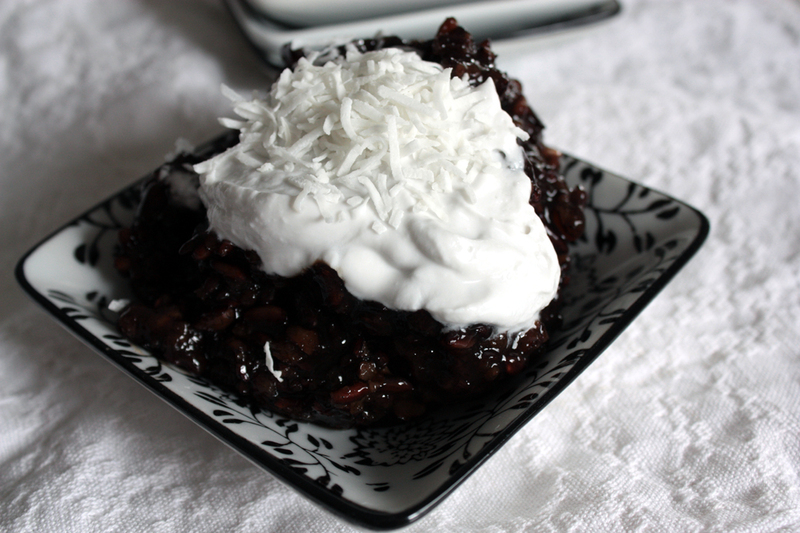 I don’t think I’ve ever come across black gluttonous rice! By gluttonous, you mean sticky rice? I would definitely try this with sticky rice. Love sticky rice and love coconut. I could just imagine the results!